Here is one of the great stories I get to hear from volunteers who have found this type of experience life changing. 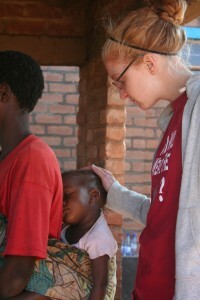 Chelsea has been to Malawi on two volunteer trips and I’m sure plans to return again someday. She is currently a college student studying at Southeast Missouri State University. I reached out my hand to him. His eyes widened; the whites contrasted immensely with his dark skin, making them look ten times bigger. It was almost as if they were too big for his face. It was so adorable though, I could not help but smile. He then snatched my hand quickly, as if he thought I would change my mind. I smiled at him and gently squeezed his hand. A huge grin broke across his face. His entire face lit up as he stared at me and clung to my hand. In that moment, standing in the middle of a village in Malawi, Africa, I realized that even in the worst situations, happiness can be found. Too often, in the best of situations, happiness is overlooked. Two summers ago, I went on a volunteer trip to Malawi, Africa. I was only 17 years old, and it was my first time traveling overseas. I had no idea what to expect, but I knew it would be unlike anything I had ever experienced. I became interested in traveling to Africa after hearing about Erin’s experiences. Erin is the mom of two girls that I babysit for. She had traveled to Malawi several times and would be leading this trip. We would be there for two weeks, and our mission was to deliver mattresses to an orphanage. Out of our group of ten, Erin was the only person I knew. This added to the excitement and anxiousness I felt. The group was extremely diverse. The age range was from 17 to 70, and we all came from different parts of the world with different backgrounds and different stories. We all had one thing in common, though; we were there to make a positive impact on the lives of the children we met. When I stepped off the plane in Malawi, I could tell that I was no longer in the United States. Everything was different. As our group drove through town to our hotel, all I could do was look out my window and stare. I wanted to look at everything. I wanted to see everything. I wanted to take in everything around me. The houses, the people, the animals, the buildings, the vehicles, everything was different. The buildings were smaller and didn’t look as sturdy as American architecture. The vehicles were not as fancy, and I quickly learned that there were no driving laws, so the roads were chaotic. Animals roamed freely; we stopped many times to let goats and chickens cross the road. Most of the people walked or rode bikes wherever they wanted to go. For the first time in my life, I was the minority. However, seeing how different everything was, made me even more excited to go to different villages and see the children at the orphanage. After all, I was here for the kids. On our third day in Malawi, we went to a “true” Malawian village. Malawian villages are where most Malawians live because only the upper class can afford to live in the city. Even a picture can’t fully express what I saw at the village. The houses were made of mud with straw roofs. They were tiny, about the size of my bedroom. I had to duck my head to get in the doorways. The kids were wearing clothes that were torn and tattered. Some barely had enough to cover their bodies. Their skin was caked with dirt; I could not tell if any of them had ever been bathed. I could see in their eyes how unhealthy they were; many had a yellowish tint. Seeing the way these kids lived was like seeing something in a magazine or one of those commercials that try to get people to sponsor a child in a third world country. Only this wasn’t a magazine or something only seen on TV; this was real life. This was the life that most Malawians lived every single day. There was no escape from the mud houses, torn clothes, dirt, sickness, and hunger. I pondered over this, but it was obvious that it was true. Mtima was simply grinning from ear to ear as we walked, our hands swinging side by side. This moment was hard to wrap my brain around. I looked at this child’s life and saw so much pain and suffering. I saw a child who was starving; a child who was dirty and had probably never had a hot shower; a child who didn’t have enough clothes to cover his body and didn’t own a pair of shoes; a child who was living in an environment bursting with disease and sickness; a child who, I later found out, didn’t even have a mother, therefore was living with an elderly woman who took care of him and four other orphans in the village. But this child saw happiness. This little boy was able to look past all of the negative things in his life and find joy, and not only find it, but spread it. Holding his hand, such a small gesture, made him happy. Mtima and I couldn’t even communicate through words with each other; however, in that moment, nothing else mattered to him except for the fact that I was holding his hand. After spending the day with Mtima, I realized that he wasn’t only happy because I was showering him with attention. His happiness was much deeper than that. He found little things in each day that made him smile and focused on those things to make himself happy. His smiling face is an image that is imprinted in my brain. It serves as a constant reminder that happiness can be found anywhere. Even if it feels like the world is ending, happiness is there if one just looks for it. Happiness is something that is created, and no matter how bad the situation, it is possible. From the eyes of a child, happiness in one moment can make one completely forget the bad and celebrate the good. If a child living in despair can be happy, surely happiness can be found and celebrated everywhere by everyone. Chelsea: I watched you grow up and become such an amazing young lady. How very fortunate you have been to travel to Africa and have this experience that I’m sure is hard to put into words. I can just picture that precious little boy holding your lily white hand and thinking an angel had came to see him that day…and actually I think that is exactly what you and Erin and the others are to Malawi. Your story is written that I could totally picture this and “be there” for a moment. My dream is to someday too get to travel with you guys and experience such a wonderful event to help others and truly make a difference in the lives of these precious children. Thank you for sharing and I hope you get to go back too.